The Block Telethon protests of 1990 and 1992 are key moments in British disabled people’s political struggle to fight for control of how they were viewed by the UK media and society. NDACA contains a significant archival record of these protests — through photos, posters, articles and even written advice on what to do if protesters found themselves under arrest. This wealth of material stands in sharp contrast to the television coverage I was able to find when conducting research as the Archivist for the BBC historical series The Disabled Century (first broadcast in 1999). One discovery from back then sticks in my mind — an ITV clip from the Telethon, a 24-hour charity broadcast which raised money for disabled people (and was despised by many for its patronising tone). The clip shows two worried Telethon presenters contending with the challenges of a live broadcast while the indistinct voices of unseen protesters drift in and out of hearing. The clip certainly does not suggest that those disabled voices would be successful in their campaign to consign the Telethon to the dustbin of televisual history. The slogans on the placards — ’Is this a Cripple Free Zone?’, ‘Ask us, Not Aspel’ — redefine the debate around disabled people’s self-image: from that of the so-called pitiable victim featured in Telethon’s charity broadcast, to justifiably angry campaigners making demands for equitable rights and representation. The protesters demanded the right to speak for themselves rather than be patronised through the filter of celebrity voices. They aimed to use protests as a battle-ground to define their personal experience, recapturing the very words that had previously been used to belittle the value of their lives. 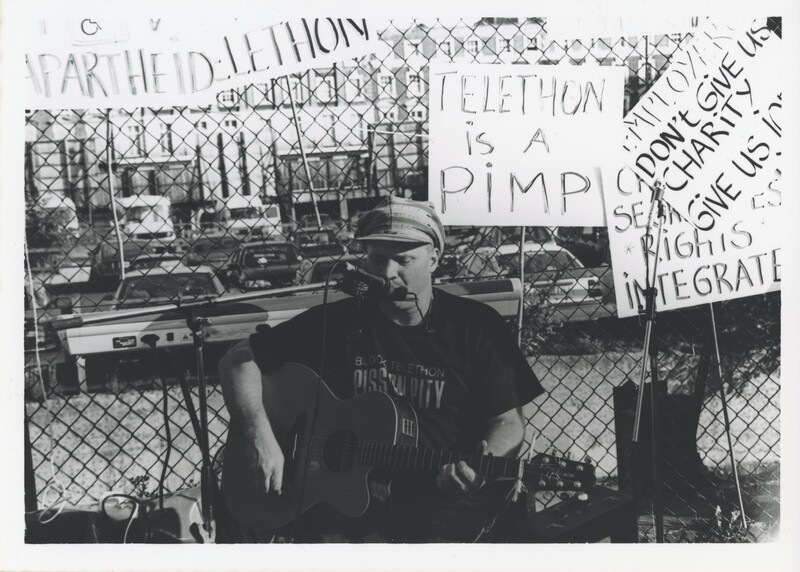 Telethon made people angry — angry enough to protest and risk arrest. Yet in this deposit from NDACA the protesters’ faces are happy and positive. The sun is out, balloons are in the sky, the disabled singer Johnny Crescendo is probably performing just off the left-hand side of the picture and victory is in the air. This is an image of joyful defiance: through the power of protest, disabled people are beginning to destroy the Telethon narrative of charitable pity. It is a significant moment within disabled people’s journey to achieving change.